Svalbard travel information and travelogue from two winter Svalbard trips. This trip review illustrates two adventure travel to Svalbard in winter, over Spitsbergen island, with the purpose of visiting its most remote areas by snowmobile and lodging in tents, igloos or refuges. The first trip was done in April 1999, taking advantage of 24 hours of continuous daylight to visit Svalbard in complete freedom, while the second tour was held in February 2001 to greet the sun rising for the first time after the long polar night. Both trips include a tour of Longyearbyen (the capital of the Svalbard Islands), Barentsburg (a village run by Russians who lives thanks to the coal mines) and Svea, another small mining community. Thanks to a branch of the Gulf Stream, the climate in Svalbard is not hard as other places of the same latitude, with temperatures often relatively mild, only a few degrees below freezing point, even in winter. The Svalbard Islands are a very remote destination with an harsh climate and therefore it is quite natural to ask why a tourist should want to visit this distant outpost, facing various difficulties, instead of choosing easier destinations. Actually, especially for Europeans, Svalbard is perhaps one of the easiest polar destination to get to and, although the price is far to be cheap, it is certainly cheaper than most destinations in Canadian Arctic, Alaska or Greenland, especially when talking about flight's cost. Furthermore, there isn't the bureaucracy that plagues many places in Russia, saving from the need of getting visa or special permits. Despite its relative civilization and the services offered, Svalbard is in any case a wild and "authentic" place where you can quietly observe the fauna and flora typical of the polar regions, where you may enjoy beautiful excursions almost all year round among majestic glaciers, or where you can see the northern lights, as well as the special light conditions ranging from an eternal night between November and January, to an uninterrupted daylight between early April and early September. 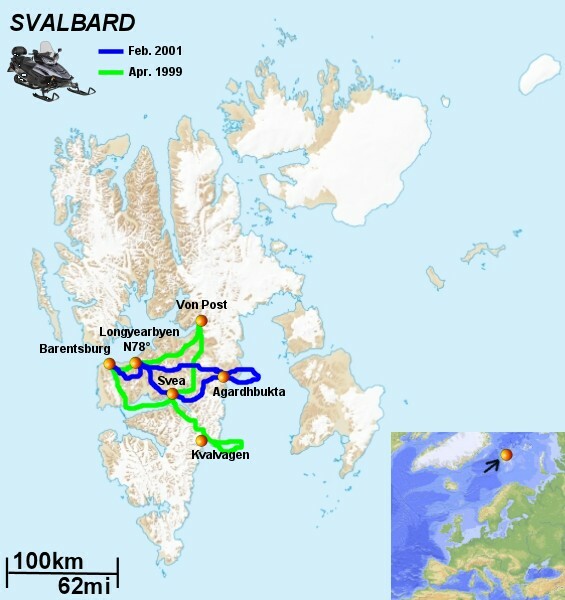 Given the distance from continental Europe, America or Asia, considering the special geographical and climatic conditions, as well as the small number of locals not guaranteeing an high traffic of passengers, you might be wondering how to get to Svalbard and if the place is really accessible without having to spend nights halfway across the world, as sometimes happen for the most isolated places in Canada, Russia or Greenland. If you want to go to Svalbard, you'll be pleased to know that Longyearbyen, the "capital" of Svalbard on Spitsbergen Island, is served by a number of flights from Oslo via Tromso and some direct flight from Oslo (flights are almost daily, up to three per day, and are relatively cheap). On some days of the week, especially during the months from March to October (high season) the flight from Oslo to Longyearbyen (and vice versa) allows same day connections to most of Europe, America or Asia, allowing to optimize journey time and its related costs. Flights to Svalbard are operated with modern Boeing 737 and despite the often inclement weather, delays are only occasional thanks to the airport properly equipped to work safely even in apparently adverse conditions. If you want to reach Svalbard by ship, currently (at 2015) there is no ferry service (in any case it would still take a couple of days of sailing to reach Longyearbyen from northern Norway), however there are operators offering cruises calling in Norway, Iceland, Greenland and continuing onto Svalbard (so you could, for example, stop at Svalbard after the cruise and return by plane or vice versa). WHAT IS THE BEST TIME TO VISIT SVALBARD? The short Arctic summer from mid June to August. The Arctic summer is an interesting time to visit Svalbard as there are greater variety of excursions available for all tastes and there is light for 24 hours day (including the midnight sun until late August). During this season the weather is cool but not extreme and you may expect temperatures ranging from a few degrees above freezing point to +15 centigrades, while the snow is almost never present at sea level or lowest hills. In any case it must be said that the climate of Svalbard is generally cloudy and even if there is few rain, overcast foggy days are very common in summer: it is also important to say that the wind is always a factor causing to feel a much lower temperature. In summer you can make wonderful multi-day cruises in search of polar bears, walruses and other typical polar wildlife: if you want to see the sea with lot of ice and some snow on the ground, it is good to choose an earlier departure in June, while if you want to have more opportunities to visit the most remote bays or to better appreciate the geology, it is best to choose a departure in August when the ice has retreated and all the snow has melted even in the north. If you want to trek or kayak, the best period is still from late July to August, when the water of melted snow has drained away, making hikes more comfortable and drier. The transition to winter from September to October. Autumn in Svalbard sees the days shorten rapidly (10-15 minutes per day), with the sun setting for the last time just before the end of October at the latitude of Longyearbyen. This time of year is still good for cruises, thanks to the minimal amount of sea ice, while the low sun provides amazing pastel colours of the sky. As the length of the night increases, the probability of observing the northern lights increase as well, while the weather is still relatively mild (the first snowfall followed by persisting snow, normally comes in October). This period is also suitable for short trekking or day trips by boat from Longyearbyen to the various attractions. If you love landscape photography, this period (especially the middle weeks of October) can be the perfect time to go to Svalbard. The polar night from November to January. After the sun has set by late October, the days continue to shorten, until mid-November when there are 24 hours of continuous darkness extending into late January. Temperatures drop, but remain always incredibly mild if compared to other regions of the same latitude (between a few degrees above freezing point and -20 centigrades) and, although the precipitation is mainly snowy, some rain is always a possibility. During this time of year the activities are limited to short half-day trips from Longyearbyen by snow mobile or dog team, perhaps to watch the northern lights away from the lights of Longyearbyen. You may also visit a coal mine, both an abandoned and an active one. This period of year is also ideal if you are just curious to experience permanent darkness throughout your stay in Svalbard: why not spending a Christmas or a New Year day in such different way? Return of the light and the "real" winter from February to April. The sun return around mid-February filling the sky with spectacular pastel colours, making this period one of the best time to visit Svalbard if you are keen of landscape photography. Although the days lengthen of many minutes per day, the temperatures become more rigid than those of the past months, averaging now around -12 centigrades with oscillations from just above freezing point to -25 or -30 centigrades. The winter on Svalbard is the ideal time for excursions on skis, by snowmobile or dog sled, to discover the most remote and spectacular corners of the island, far away from Longyearbyen or other communities. However, you should know that in recent decades the winter temperature on Svalbard has constantly increased, causing more and more frequently fjords not to freeze anymore or to have just unsafe ice. Unfortunately most tour operators had to progressively change the itineraries to avoid open water and therefore excursions to some of the places shown in this travelogue are no longer possible due to global warming. The transition to summer in May / mid June. The sun shines for 24 hours a day from the second half of April and the temperature rise quickly. The month of May sees gradual snow melt starting from south, progressing to the north well into June. This period of transition to the summer makes most excursions less comfortable because the land is damp due to melting snow, while the sea may still have too pack ice for small boats or kayaks. This is probably the only period of year when tours to Svalbard should be planned more carefully or reconsidered. WHAT ARE THE MOST IMPORTANT ATTRACTIONS IN SVALBARD AND WHAT TOURS SHOULDN'T BE MISSED? The major tourist attractions of Svalbard are certainly the nature and the landscape, without forgetting to visit the small communities, even for just simple curiosity. Most tourists who come to Svalbard do to visit the archipelago in the summer on small cruise ships that can negotiate the ice, sometimes reaching the most remote corners of Spitsbergen (the main island of Svalbard archipelago) or getting all the way to Nordasutlandet (an island covered by an ice cap which is the third largest in the world, after Antarctica and Greenland) through other minor islands. In addition to admiring postcard landscapes dominated by mountain ranges and large glaciers that flow into the sea, the cruise offers the best chance to closely observe polar bears, walruses and whales under the endless light of the summer polar. Other excursions that allow you to admire the beautiful landscape of Svalbard, although making more difficult to see the animals up close, are those by snowmobiles, sled pulled by dogs or by skis. Local operators offer various winter tours of different levels of difficulty and length, with or without overnight stays in the middle of nowhere (which may include sleeping into igloos, tents or remote refuges). Unfortunately, because of climate change, many winter itineraries have been reduced in recent years, as most fjords do not freeze anymore, but if you're lucky enough to be able to drive the snowmobile on a frozen fjord, up to the glacier flowing into the sea (maybe doing some zigzag among icebergs), this may be one of the most exciting experiences you can do in Svalbard. Below you will find other useful information about Svalbard, which could be useful when planning the tour and during the journey. Which nation owns Svalbard? Although Svalbard are part of an international treaty for which many nations have the right to exploit its resources (the Svalbard Treaty), the archipelago belongs formally to Norway. On what time zone is Svalbard? Svalbard adopts Central Europe Time (CET), same as Rome, Paris and Oslo. Daylight saving time is active in summer as in the rest of Norway. What is the currency in Svalbard? : the official currency in Svalbard is the Norwegian Krone (NOK). Credit cards are widely accepted almost everywhere and ATM machines are available as well. What to expect from Svalbard weather? Although very close to the North Pole, Svalbard enjoys an exceptionally mild climate where the temperatures are comparable to those of high mountains in southern Europe. However, do not forget that the place is often quite windy and this causes to perceive a (much) lower temperature. In addition, although the rainfall amount is actually similar to those of an arid area, overcast conditions with low clouds and mist are very common especially in summer. What to bring in Svalbard? Not mentioning the common items, you must bring a good hat (preferably two or three, if one gets wet), as well as a balaclava and goretex gloves, regardless of the season, and always keeping in mind the wind factor. Very useful will be a rain ponchos to wear on top if necessary. If you are taking a cruise and you suffer from seasickness, do not forget the remedies you know to be effective (the sea is generally very calm in the fjords, but during the crossings in open areas, the ship could "dance" a little bit). Very useful it may be small backpack to be used for day trips, while waterproof bags will protect your camera from sprays, mist and condensation (if used properly). Longyearbyen, on Spitzbergen island, is the Svalbard's main administration center and has excellent facilities, for both tourists and residents, considering the latitude. Excursion to Svalbard museum and hikes in the town. Snowscooter trip to Barentsburg from Longyearbyen. Barentsburg is a little Russian mining town, living on coal mines. The snowscooter trip takes about two hours each way. The expedition to the most hidden parts of Svalbard starts today, driving the snowmobile from Longyearbyen to an area designed as campsite. Here, the group overnight into a small igloo, under a sky made of millions of stars and northern lights. Snowmachine excursion to the east coast of Spitsbergen island, driving over glaciers and pack ice trapping huge icebergs. By snowscooter back to Longyearbyen, with lunch stop in Svea. Today the weather is really beautiful and the cold, together with a sun very low on the horizon, even at mid day, produce incredible sky colors going from pink, to orange, to violet, to deep blue. Hikes in Longyearbyen, before descending into a cave under a glacier, for an ice cave excursion. Visit to a coal mine (where it wasn't permitted to take pictures). A four days expedition thru Svalbard by snowscooter starts today, driving from Longyearbyen to Barentsburg for the first lunch stop. After a short break in Barentsburg, the expedition to Svalbard by snowmobile continues driving over glaciers and frozen fjords all the way to Svea for the first overnight. Excursions to the east coast of Spitsbergen island by snowscooter. Today the weather is superb and there are lots of wonderful places to see, with many glaciers flowing into the frozen Arctic ocean. Return back to Svea to overnight. The expedition to Svalbard by snowmobile ends today, driving from Svea back to Longyearbyen via the beautiful Von Post glacier.